Imagine clear turquoise waters, a blazing sun, and stepping onto a cruise ship that is about to float you all the way to the place where Darwin found his inspiration for his groundbreaking work in ecology, science, and understanding the world itself. Amy & Jackson garnered over 1,000 votes last year for their Happy Hearts Love Sharks contest entry to win the grand prize trip to the Galapagos for going Fin Free at their wedding to protect sharks. Wanting to save the trip for a time they could commemorate their special day, they recently just came back from their grand prize cruise for their one-year anniversary. Were you excited about your trip? How did you prepare for it? Were there any special items that you brought with you? It was our dream to visit the Galapagos Islands, so we were SUPER excited! The Galapagos Islands were truly an amazing place. There were something that blew us away every day! We did some research about the islands, the animals, history, and culture prior the trip. We brought binoculars, underwater camera, lots and lots of sunscreen, motion-sickness pills, water shoes, and snorkeling gear. What is the most beautiful thing that happened on your trip? 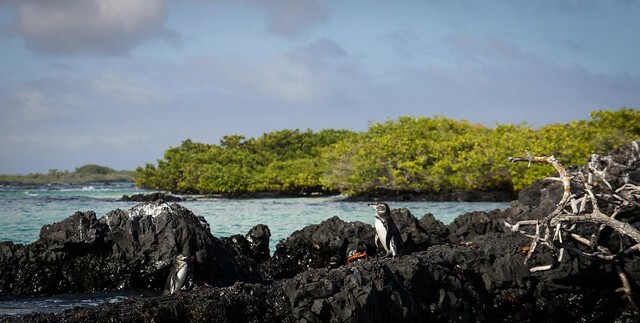 There were lots of “National Geographic” moments where we stopped in front of a small island in the middle of the ocean on our speedboat, surrounded by numerous wildlife unique to the island – from blue-footed boobies to Galapagos penguins to marine iguanas. The whole trip from beginning to the end was beautiful. 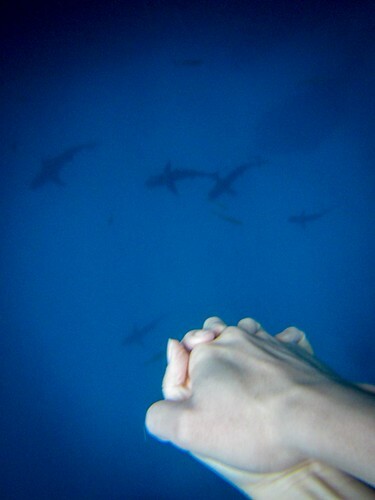 What was it like to see sharks in person for the first time? It was a mesmerizing breathtaking moment seeing more than a dozen Galapagos sharks and a baby Hammerhead swimming below us while snorkeling (not even scuba diving!!). We were just overjoyed and stunned! We would love to go back someday to scuba dive and see whale sharks! What do you have to say to couples that are on the fence about taking shark fin off their banquet menu? There won’t be another opportunity as unique as your wedding for you to gather all your family and friends. Use this opportunity wisely to educate them about the importance in conserving sharks and take action to save sharks together! So, it’s time to break the tradition and do the right thing! Be open and honest about your decision with both parents. You may find that they are more receptive and supportive about it than you can imagine! Is there anything else you’d like to share with us? It was a one year anniversary gift that we have never dreamt of receiving. We would like to thank Shark Truth, Flight Centre, G Adventures, and all those who have supported us. All of you have made our dreams come true! We are forever grateful! Check out some photos from their trip on Flickr. Bid 2012 Happy Hearts Love Sharks winners, Amy and Jackson, a warm bon voyage for their deluxe cruise trip to the Galapagos! After almost a year of anticipation, Amy and Jackson are off to claim their grand prize trip sponsored generously by Flight Centre and G Adventures to the world-famous Galapagos islands: home of the blue-footed booby (yes – it’s for reals) and many species of beautiful sharks such as the majestical hammerhead. Can’t believe it has been almost a year since our Fin Free wedding! Are we dreaming? Tomorrow, we will be setting foot on The Enchanted Islands of the Galapagos to celebrate our first year anniversary! The excitement and joy we feel are indescribable. We know that this trip will always have a special place in our hearts for many years to come. We feel that going Fin Free and joining the Happy Hearts Love Sharks Wedding Contest 2012 to raise awareness for shark conservation was one of the best decisions we have made. Not only did we create a buzz around our family and friends (even relatives in Hong Kong!) 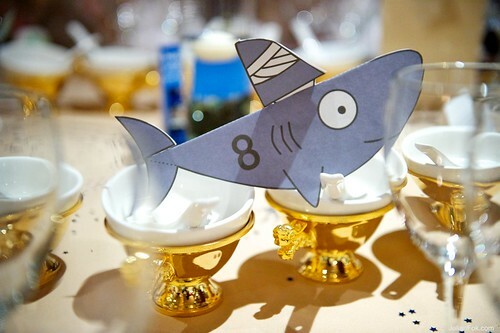 to discuss about the truth behind shark fin products, some of our friends joined us in solidarity by going Fin Free at their own wedding banquets too! Great thanks to Shark Truth, Flight Centre, G Adventures, and our family and friends for supporting us all the way. We know that if it were not for you, we would not be going to this once-in-a-life-time anniversary adventure! We love you all! The Happy Hearts Love Sharks contest is a way for couples to take action to protect sharks from shark fin products at one of the most important moment in their lives: their wedding. Spreading the message to all their friends and family, they stand up to showcase that there are other alternatives to shark fin products and ways of looking at how we are generous to our guests. At their wedding alone, they had 230 guests who went Fin Free, adding to our total of 80,000 bowls of shark fin diverted from consumption through this model. We wish them a truly amazing time on their 1-year anniversrary. We’ll be sharing some media from their sun-filled adventures with you upon their return in two weeks. Huge shout out to our 2012 lead sponsors for their generous partnership and support in the 2012 contest: Flight Centre and G Adventures. Thank you again to all the couples who participated in last year’s contest – you are all our shark champions. Keep us in mind as your friends tie the knot for 2013 as we prep for this year’s Happy Hearts Love Sharks contest! The Briefing at UBC – Come out to help Shark Truth win some moola! There are a group of young, passionate students from UBC who throw an event every year where they invite nonprofits to share their story, and the one voted the best gets a chunk of moola from the proceeds of the event. Shark Truth will be there as one of the nonprofits presenting, will you come out to support us? Only 150 seats available and they’re going quick! Free admission and food. THERE WILL BE NO WALK INS ALLOWED! More information: UBC Dollar Project is holding its biggest event of the year: THE BRIEFING 2013. This year we will be having 5 local charities presenting their causes to a diverse crowd of stimulated individuals – namely you! You get to decide the outcome by voting on 1 winner to receive all donations to support their project. There will be FREE ADMISSION and FREE DINNER as well. All delegates have one vote! The charity with the most votes will receive a monetary price! In addition to that, there will also be RAFFLE PRIZES and GUEST PERFORMANCES. What is Dollar Project? : UBC Dollar Project is an award winning global issues club centered around collective action and eliminating apathy by promoting a culture of awareness and dialogue, and by spurring individuals to act. We are committed to taking action in a timely manner and to leading by example through innovation, volunteering and fundraising.